Tyrone Bell, BPI Sports’ Training Expert, is back with another edition of Muscle Intelligence. 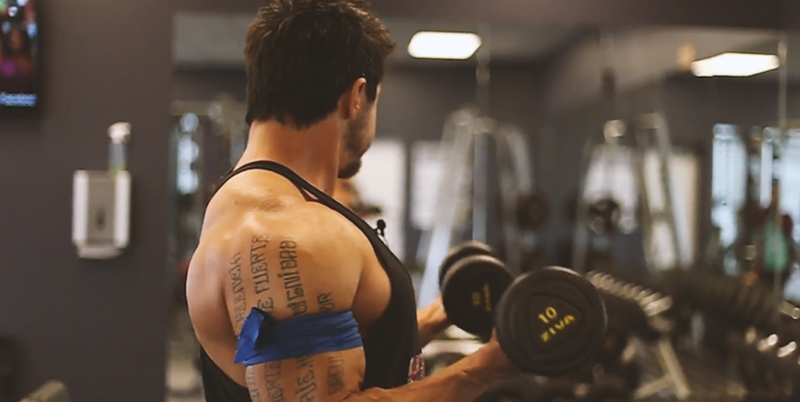 This week we’re talking about occlusion training, also known as blood flow restriction training. “Blood flow is important for anabolic growth effects. Blood is responsible for the transport of oxygen, nutrients and many other molecules critical for physiological responses to achieve anabolism. As a result, an entire category of sports supplements has emerged in the past 10 years focused on increasing blood flow to enhance anabolism. But what if I told you that the opposite is true as well? What if I told you that occluding blood flow to muscles can also have an anabolic effect? Well, that’s what occlusion, or blood flow restriction training, is all about. It has years of research to support its effectiveness. Basically, blood flow restriction training involves restricting the return of blood flow from the muscle. We want blood to be able to travel into the muscle, but restrict blood flow returning from the muscle, thus causing a blood pool effect. This is accomplished with the use of a restriction. Most easy and accessible is knee wraps, securely tightened about the targeted muscle – tight enough to restrict the veins but not too tight to restrict the arteries. When performed properly, occlusion training actually allows you to use much lower weights than normal and still achieve hypertrophy training responses. In fact, occlusion training can increase muscle size using training loads as light as 20% of your one rep max (1RM). Now this is extremely interesting seeing as it’s well considered that lifting at least 65% of your 1RM for 6-12 reps is necessary to achieve hypertrophy under normal conditions. As you guys know, anything under that intensity is going to do next to nothing for hypertrophy effects. Yet, muscle hypertrophy is occurring at much lower intensity via occlusion training. Occlusion training induces an anabolic response through various pathways, so we’re going to look at each of these. Fast Twitch Fiber Activation – Muscles are made up of two fiber types: Type 2 (fast twitch) and Type 1 (slow twitch). Type 2 fibers are the ones that grow easier, but they are only recruited when you go to failure or when you use loads that are 80% of your 1RM. Occlusion training restricts blood flow to your muscles, pre-fatiguing the Type 1 fibers and forcing the recruitment of the Type 2 fibers to handle the load, even at low intensities. Metabolically, your muscle is getting a similar effect to lifting heavy loads but you’re using much lighter weights. Metabolic By-product Accumulation – When you train, you cause a build up of metabolic by-products in the targeted muscle. Under normal conditions, a good percentage of these metabolic by-products are washed out by blood flow. But occlusion training allows them to accumulate. Lactate accumulation in particular has an anabolic effect because it increases growth hormone (GH) concentrations. In fact, one study found that blood flow restriction training caused a GH increase of 290 times above baseline. This is a two-fold increase in GH over what is produced by normal, heavy resistance training. Increase in Anabolic Triggers – If the two previous reasons weren’t convincing enough to try occlusion training, consider that it also has been shown to increase muscle protein synthesis as well as satellite cell activation. Perhaps even more impressive, blood flow restriction training has been demonstrated to reduce myostatin concentrations. For those of you who don’t know what myostatin is, it’s a big-time inhibitor of muscle growth, and is thought to limit the potential for muscle gain. Blood flow restriction training can be performed easiest on the legs, calves and upper arms using firmly wrapped knee wraps. To occlude the targeted muscle, wrap at approximately 70% of max tightness around the upper-most part of the muscle. If you’re feeling a tingling in the extremities of the wrapped limbs or your limb is turning a blue shade, you have wrapped too tight. Unwrap and wrap again. To optimize this technique, perform 3-5 sets to muscular failure with only 20-50% of your 1RM. Keep the muscle occluded the entire time. Rest periods should be limited to 30-60 seconds between sets. After the final set, remove the wrap and restore blood flow to the targeted muscle. A word of advice: be prepared for a lot of pain, and if you do not find yourself in pain, the odds are, the wraps were not tight enough. If done right – tied right, rest times on point, and correct load selected – blood flow restriction training can help trigger a huge hypertrophy response.